Many thanks for your comments and contributions guys. I’ve bitten the bullit and secured a Plowmate, it’s on spade lug wheels and in excellent unmolested condition. I’ll post pictures when I get her home and stabled. 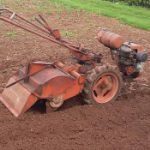 I’m looking for a machine to participate in ploughing matches. I regularly see Trusty’s and Anzani’s, I thought a BMB or Barford would be a little different. Does the BMB Ploughmate have a reverse gear and a differential, ie not a sold fixed drive axle. Does the BMB Ploughmate have. Reverse gear and a differential, ie not a sold fixed drive axle. This is my first “oily rag resto” hence I’m on a steep learning curve. Farming was never this difficult . I have a Howard 400 rotavator that I’ve recently brought back to life. It has the JAP 4/3 engine which now runs strong. I removed the engine for bench work and went through the rest of the machine cleaning out the gearbox but didn’t disassemble it.